Leading Manufacturer of multi spindle drilling from Thane. 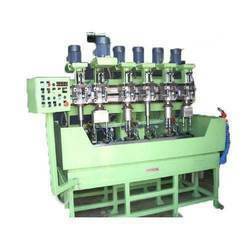 We are the prominent manufacturer and exporter of Multi Spindle Drilling & Trapping Machine. These are manufactured from best raw material and are easily available at very reasonable price. These multi spindle drilling & tapping machine required for automobile industry & graphite block manufacturing industry. Our client can avail these machines at competitive price. Looking for Multi Spindle Drilling & Tapping Machine ?